Despite the rain showers the country was in full swing with parties being held up and down the country to celebrate a very special birthday at the weekend. I recently posted hints and tips on how to easily arrange a party without having to pay through the nose for it. Hopefully you managed to put some of these to use and found a dry spell in the day to eat your sandwiches, but most of all I hoped you all had a fabulous time. There is still time to get the youngsters involved in our competition. With a selection of Gruffalo soft toys being given away to the first 200 entries, it’s never been a better time for the kids to colour in. To be in with a chance of winning simply download and print our colouring in picture below and get your little one(s) to colour this in then send it to us. The first 200 entries received will win! Good luck! 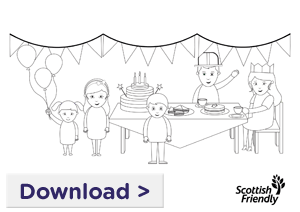 You can also email your child’s entry to competitions@scottishfriendly.co.uk, or by post to Marketing, Scottish Friendly House, 16 Blythswood Square, Glasgow, G2 4HJ. Don’t forget to provide your contact details.